Shane Guffogg began the 'Circle of Truth' project with this painting. See all 48 artist responses at NUMU. The idea was simple enough. Over the course of seven years, 49 artists created paintings inspired by a single theme: "Truth.". They collaborated—albeit remotely and virtually—until 49 smaller, yet not less significant, truths emerged. The results, now on display at the New Museum of Los Gatos, are a revelation. Not so much in the individual cultural artifacts themselves but in culmination, as they offer a window on how each of the artists think. In this way, "Circle of Truth" works a bit like an old-fashioned psychological exam. It is a Rorschach test for the ages. It is the artist's psyche we see on the canvas, formulating thoughts or shouts or dreams. Co-curators Laura Hipke and Shane Guffogg asked participating artists to play a painterly version of the surrealist game exquisite corpse—a.k.a. the Telephone Game. The rules were detailed but fairly loose. 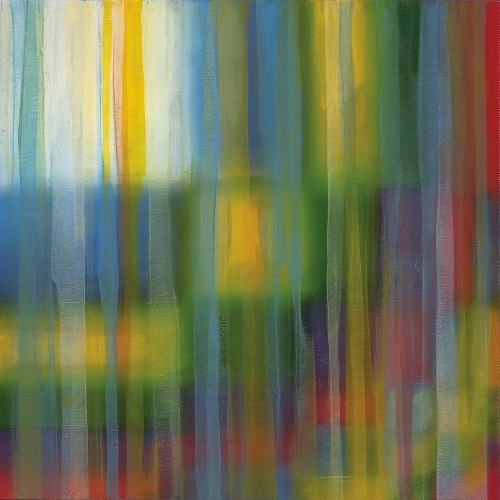 The first artist in the chain, Guffogg himself, started the project with his painting, a Rothko-esque take on a blurred, madras plaid. Without signing the work, he then sent it to the second artist in the chain along with a blank linen canvas. Keeping the theme of truth in mind, each artist then had two weeks to come up with a painted response before sending their piece on to the next artist in the circle. Every painting is 20 square inches. They are arranged on NUMU's walls in the order they were created. The curators also asked that the artist write an essay about their experience once the painting was finished. Excerpts from those essays hang underneath the work. For his part, Guffogg had this to say: "The Golden Mean is the mathematical code of nature that gives the flower instructions on how to grow its petals." His initial foray into philosophizing later gave way to a doleful anecdote or two. Lita Albuquerque, Artist No. 33, had some trouble. "I could not get anywhere and was very frustrated and covered it over many times as it just was not happening," she writes. But as you move about the gallery, you pay more attention to the shared visual language that jumps from canvas to canvas. You can see the gears of each artist's mind turning as they interpret and recapitulate the "visiting" work in their own style. In the run-up to Albuquerque's angry gray brushstrokes, you watch the forms and colors evolve to meet her painting as if in real time. Cheryl Ekstrom describes her all-white No. 28 as "a retaliation" against No. 27. It looks like a block of freshly cast plaster that's cracked after falling from a great height. Greg Colson sees a face in the center of that white slab. He uses a watery black outline to shape someone's masked profile, adding in the words "bandage," "bandana" and "blindfold." Alex Gross senses something clinical about Colson's work. At the top of his canvas, he paints in all capital letters: PROTECTION RESTRICTION ADDICTION. Beneath that, two women appear in an illustrated style that recalls a colorless Roy Lichtenstein, as if they'd been drawn monochromatically with a fine lead pencil. A nurse from the 1950s inoculates her patient, a contemporary girl who's holding onto her iPhone while also sporting a neck brace. Pale peach polka dots appear at random intervals across the canvas. Those abstract dots make an appearance in the next four paintings. If there's a single truth that emerges from the exhibit, it's that artists like polka dots. Art exhibits that claim to be immersive experiences flood 21st-century audiences with too much audio or visual stimuli. There's no need for the viewer to come to any conclusion about it. You experience the work and then walk away from it. "Circle of Truth" redefines what "immersive" can mean. Following the numbers on the walls feels like you're going on a scavenger hunt or putting together a puzzle that's challenging, but not impossible, to solve. The progression of numbered paintings requires a certain level of engagement with the entire organizing principle. You want to suss out the way each artist moved ahead with the project (or didn't, in a very few cases). "Circle of Truth" brings the museum-goer in close, the way they must have done before the analog world turned into an infinite number of zeros and ones.